Tag line: "This brain wants to LOVE...this brain wants to KILL!" 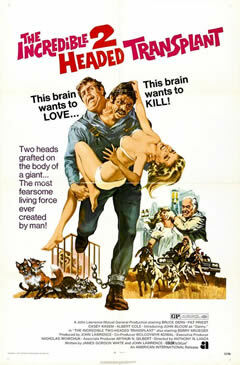 Things get off to a pretty brutal start in 1971's The Incredible Two-Headed Transplant. One of the first images we see is that of an elderly couple laying dead, murdered in the front room of their home. We then make our way to the back bedroom, where the killer is holding their daughter captive with a meat cleaver, kissing and caressing her as she struggles to break free. Even at this early stage, a chill runs up our collective spines, the kind you get when you just know everything is going to end very, very badly. Fortunately, the police arrive on the scene to prevent any further bloodshed, and take the killer, whose name is Manuel Cass (Albert Cole), into custody. Following the arrest, the action jumps straight to Cass' trial, where he's declared insane and turned over to the state's mental institution. As the judge reads his verdict, all Cass can do is laugh, as if everything is one terrific joke. It's a disturbing opening to what will ultimately prove only a mildly entertaining sci-fi/horror film. With Cass safely tucked away, the story shifts to the secluded home of Doctor Roger Gerard (Bruce Dern) who, with the help of his associate Max (Berry Kroeger), is conducting experiments which involve grafting a second head onto living creatures (as to what benefits this would provide medical science, who knows?).. Thus far, they've had some success “bi-heading” a variety of animals, yet both men are anxious to take their experiments to the next level: performing a two-headed transplant on a human being. Roger's wife, Linda (Pat Priest), has no idea what her husband's up to, and complains he spends far too much time conducting his experiments, but Roger's too close to the ultimate breakthrough to slow down now. Then fate intervenes in the form of our good buddy, Manuel Cass, who escapes from the hospital and, as luck would have it, finds his way to the Gerard house, where he kills the caretaker (Larry Vincent) and kidnaps Linda. Roger and Max eventually track Cass down and shoot him, yet just before the escaped lunatic dies, they remove his head and attach it to the body of their late caretaker's retarded son, Danny (John Bloom), a giant of a man with the brain capacity of a child. The surgery is a success, but what they didn't bank on was the monster they would create in the process. The performances delivered by the cast of The Incredible Two-Headed Transplant are a definite mixed bag. The usually reliable Bruce Dern looks as if he's sleepwalking through the part of Roger, bringing no life whatsoever to what amounts to the film's key character, and Pat Priest, who for years played Marilyn on the television sitcom, The Munsters, is more eye candy than anything, parading around in halter tops and bikinis to show off her admittedly impressive physique. On the plus side, radio personality Casey Kasem has a brief but effective appearance as Roger's closest friend, and Barry Kroeger, though looking frail, shows some life as Max, the assistant whose selfish motives have clouded his reason. As the two halves of the creature, John Bloom plays the simpleton Danny a bit too simply, while Albert Cole successfully snarls his way through the part of the psychotic Cass. As for the effects, I have to say the creature itself is fairly convincing (though, surprisingly, it looks better standing up than it does lying down). Yet what's truly memorable isn't the sight of a two-headed man walking around, but the internal conflict that torments the creature, the battle of wills that soon has the passive Danny succumbing to the maniacal Cass' thirst for blood. The first time the creature kills, the unfortunate victims are a couple of teenagers who were simply in the wrong place at the wrong time, and while the Cass “half” revels in the bloodletting, laughing as Danny's two huge hands choke the life out of the teens, Danny, whose mind is no match for his evil counterpart's, can only look on in horror at the faces of his victims, tears streaming from his eyes. It's an interesting conflict, one that plays out rather well, and, combined with the tense opening sequence and a rabid (though occasionally over-the-top) performance from Albert Cole, transforms The Incredible Two-Headed Transplant into a film that, at the very least, is worth the 87 minutes of your time it demands. Lynn: Thanks for stopping by, and yes, the end of Horror Jungle is sad news. But rest assured, some of the hosts are getting together on another podcast. I can't say anything more now, but stay tuned! Thanks for listening, and for supporting the show. Lynn: Your best bet is to check each of the hosts sites on a regular basis, and while neither Billchete or myself are currently a part of any new show, we aren't ruling out appearances from time to time! Thanks again for stopping by, and for supporting the show.